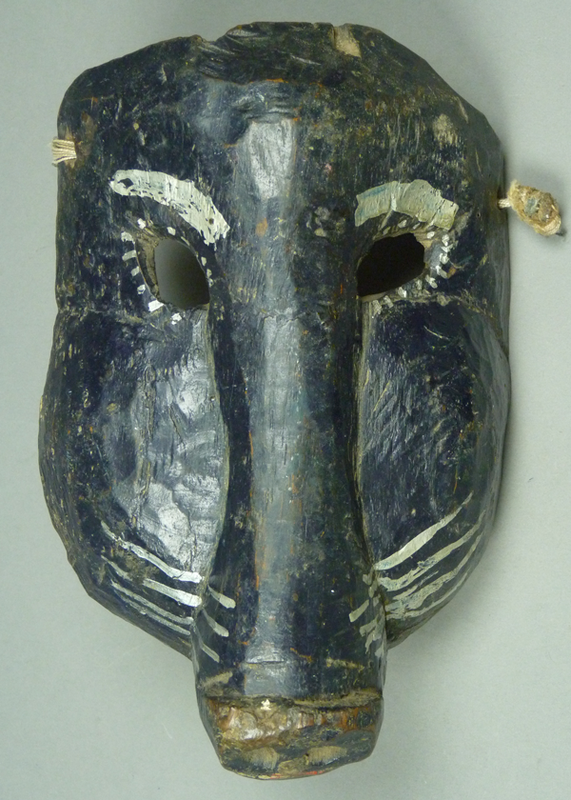 In the last two posts we have examined animal masks that were apparently used interchangeably during Todos Santos (All Saints/ All Souls) and Carnaval. 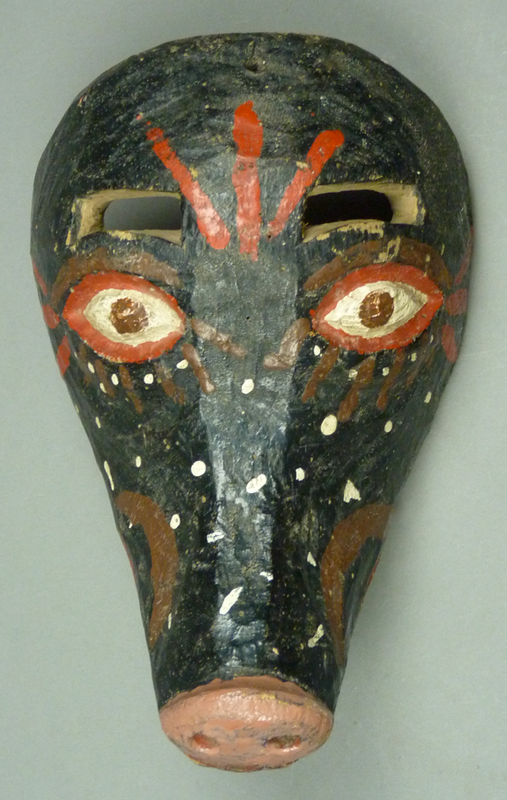 Today I will show one more group of such masks. The first is a pink dog from Hidalgo that I got from Jaled Muyaes and Estela Ogazón in 1999. He has the appearance of wearing goggles. The flaps of his ears are carved in relief. 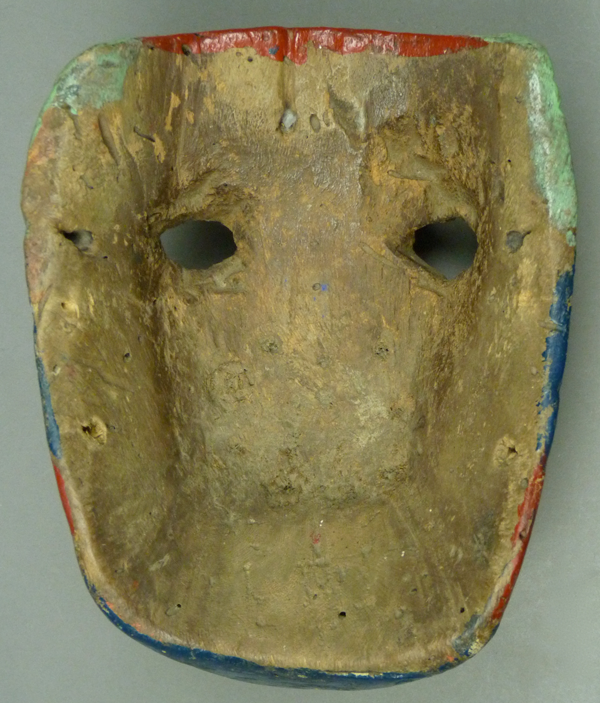 This mask is 8 inches tall, 5¾ inches wide, and 3½ inches deep. It has a worn back. 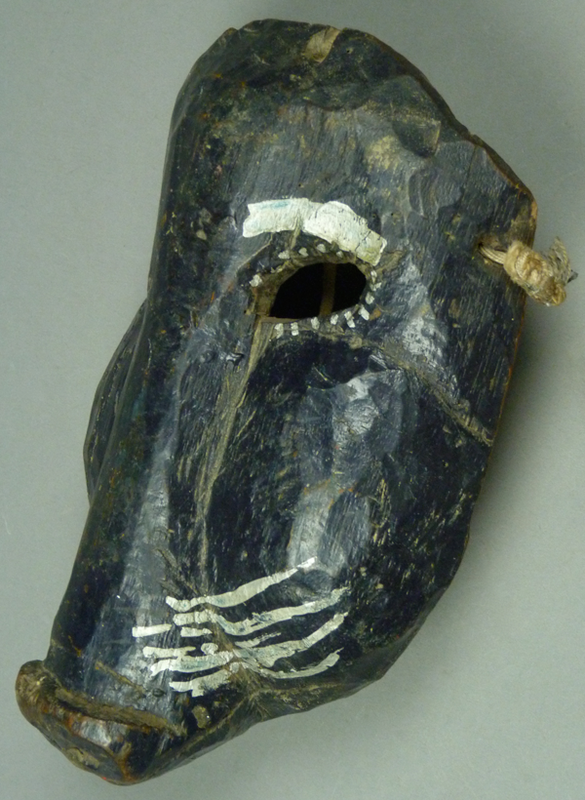 Notice how the carver has created hollow spaces around the openings in order to create space for the dancer’s eyes and lashes. 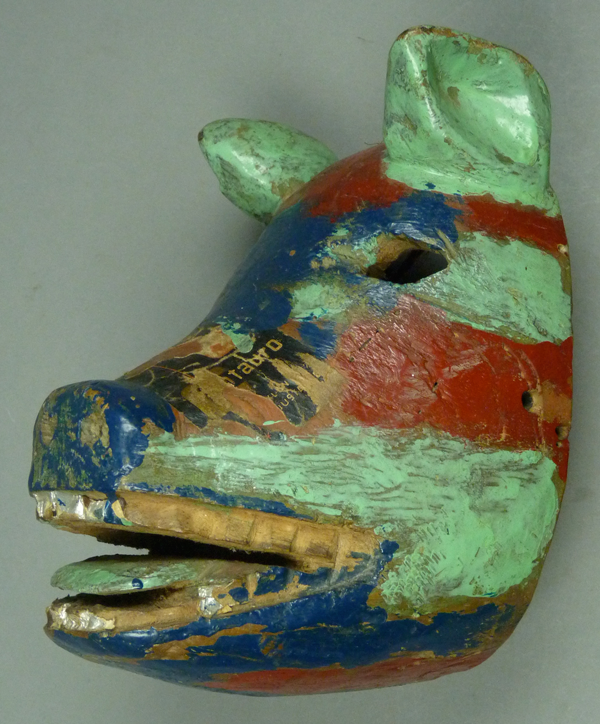 The next mask appears to be a pig Xantolo from Hidalgo. I also got this one from Jaled and Estela in 1999. It has a long muzzle. 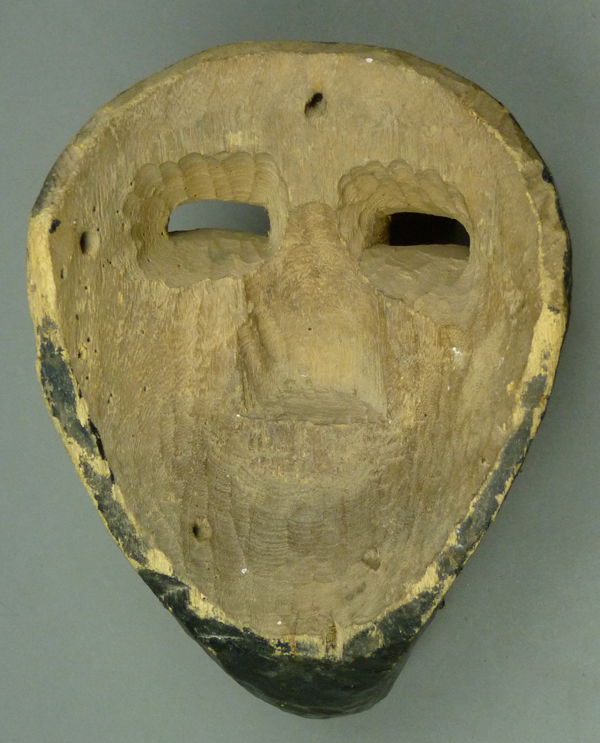 On this mask and the next, the vision openings are very carefully carved. 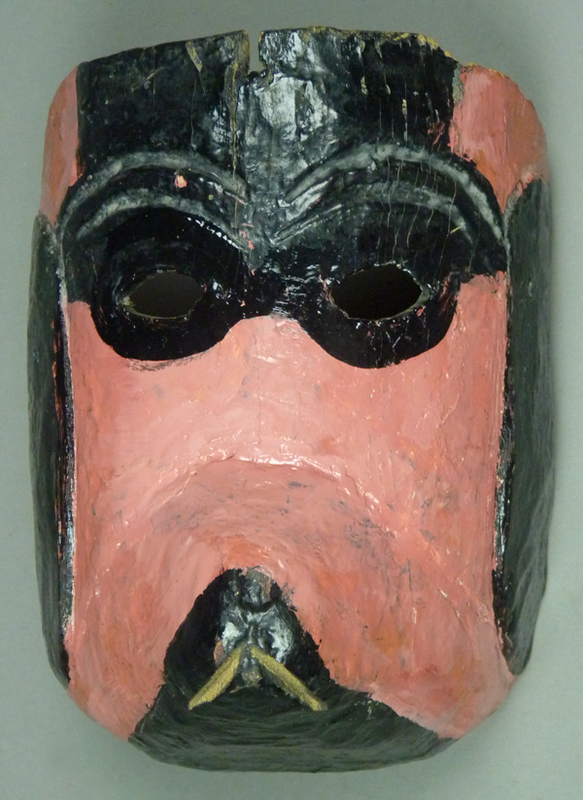 This mask is 8 inches tall, 5½ inches wide, and 5 inches deep. It too shows moderate wear. 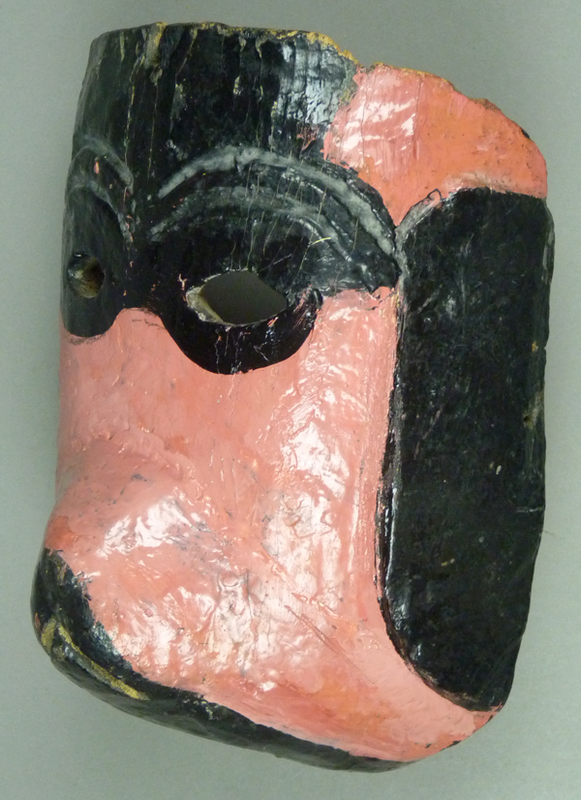 The next mask, a dog Xantolo from Tamoleon, Hidalgo, was obtained from Jaled and Estela in 1998. This dog has a friendly smile but with many teeth. 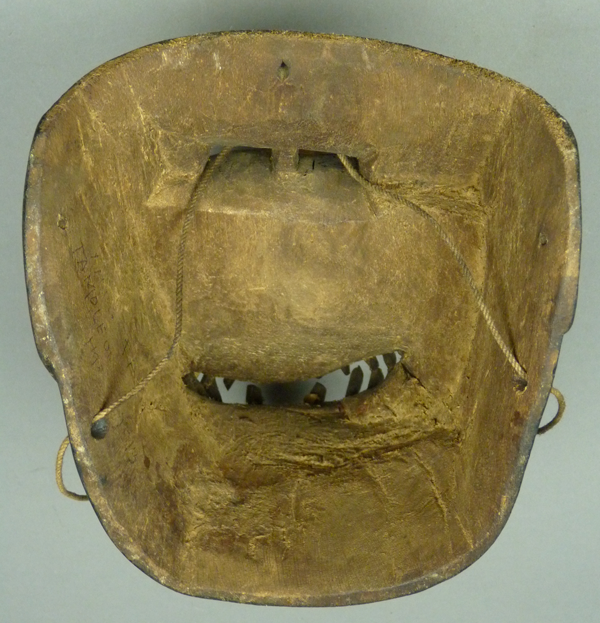 The mask is 8 inches tall, 6½ inches wide, and 7½ inches deep. 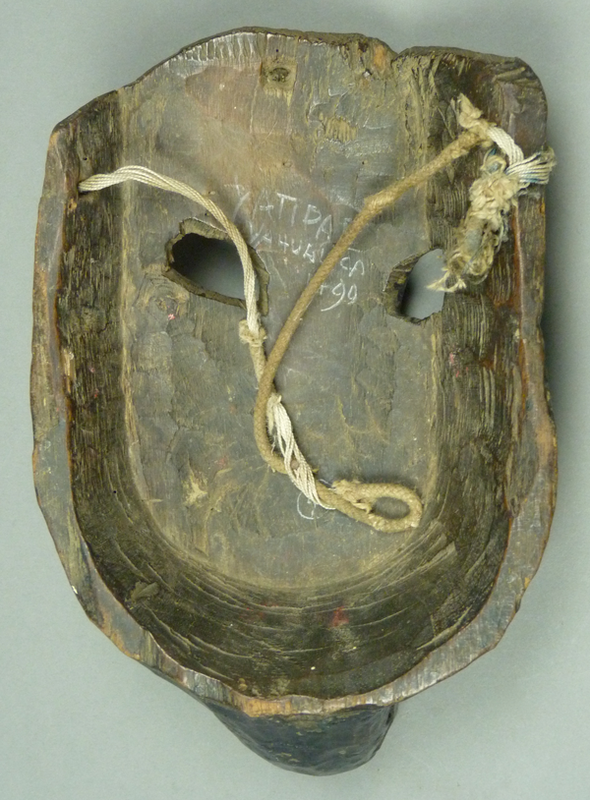 On the back one reads “xantolo family, Tamoleon, HGO.” This mask has seen substantial use. 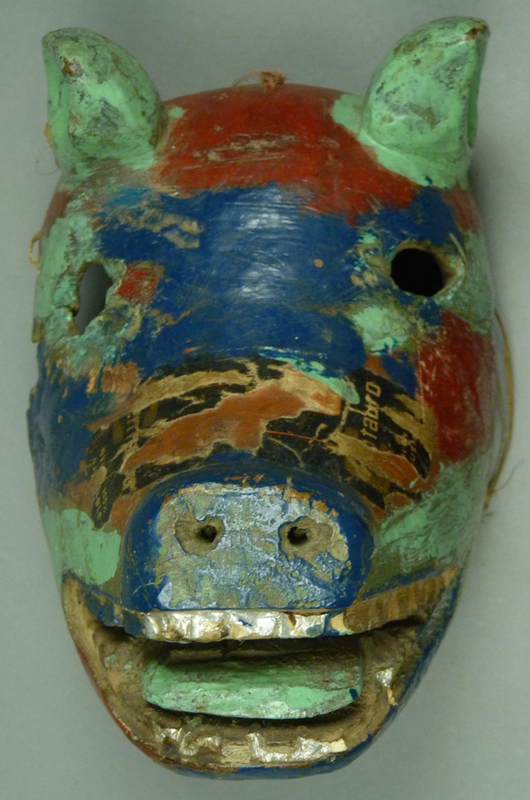 The next mask is another pig, but so different from the last. It too came from Jaled and Estela in 1997. 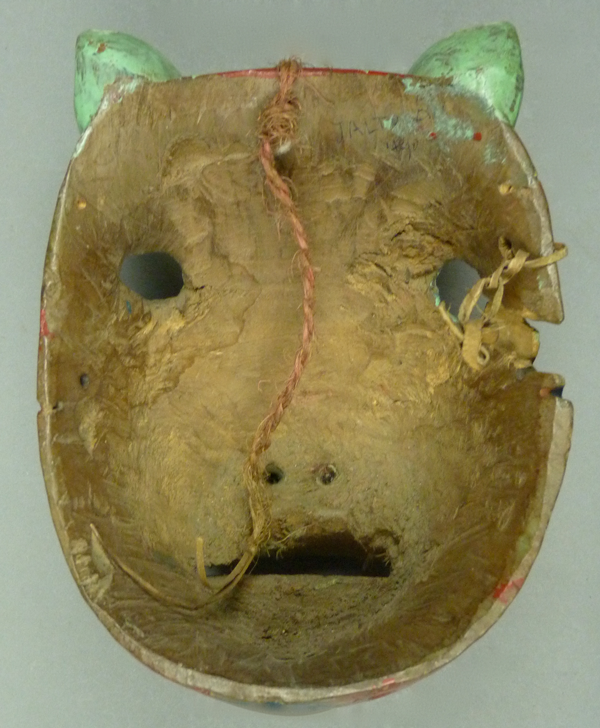 This is another animal mask where the mouth was cut with a saw. Doesn’t it have a charming face? 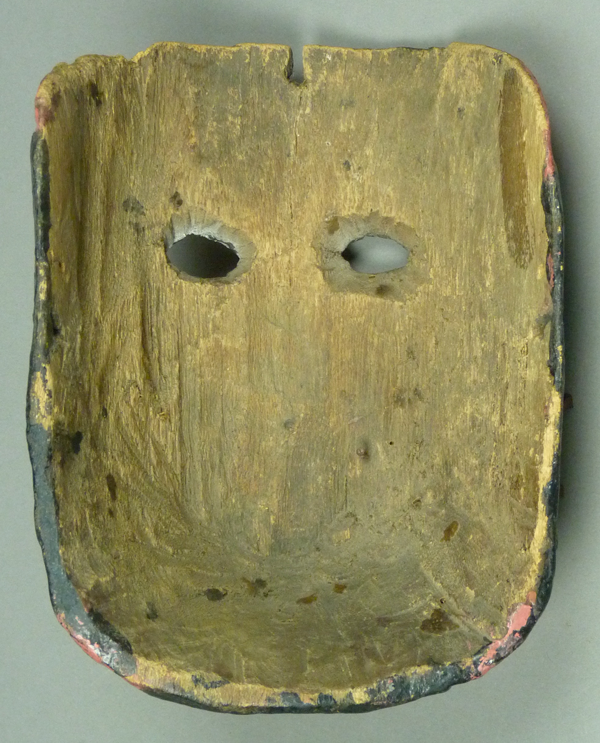 This mask is 8½ inches tall, 5¾ inches wide, and 2½ inches deep. The back shows extensive wear. I will end with a pair of masks by another hand, a dog Xantolo and a Pig Xantolo. Although carelessly repainted, they have great vigor. 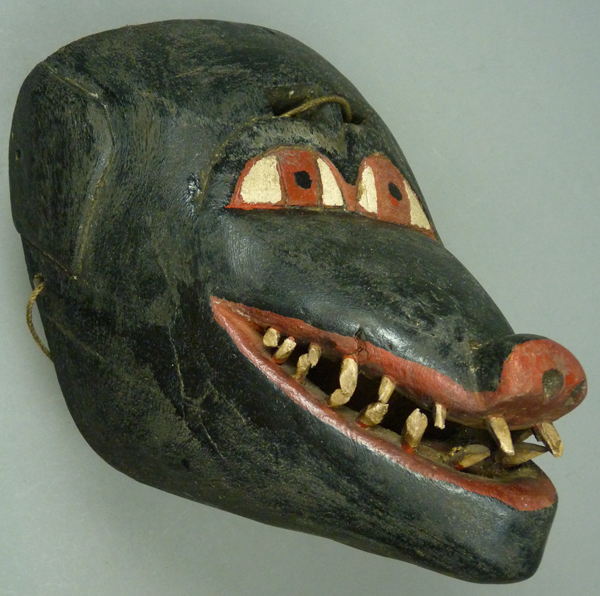 In the link that follows we see a pig Xantolo dancing at the end of a line of human faced masks. That dancer is wearing jeans, a dark blue shirt, and a red bandanna around his head. Here is another Dog Xantolo. 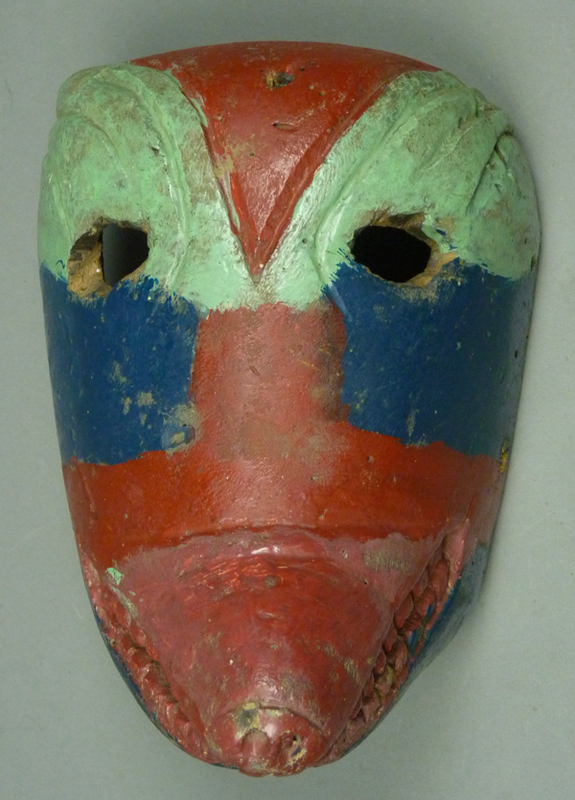 This is another of those primitive masks that are remarkable despite their simplicity of design. Grrrr! 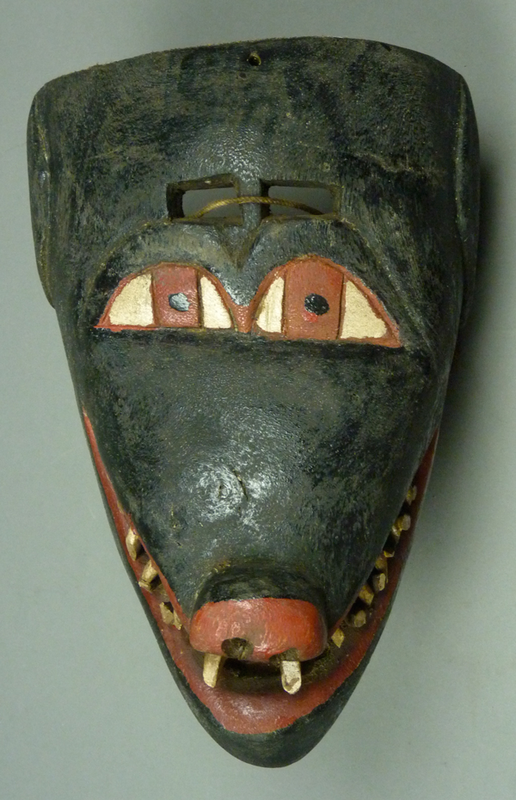 This mask is 8 inches tall, 6 inches wide, and 4½ inches deep. Here is what appears to be a matching pig Xantolo. Some sort of paper label was pasted on to enhance the design. 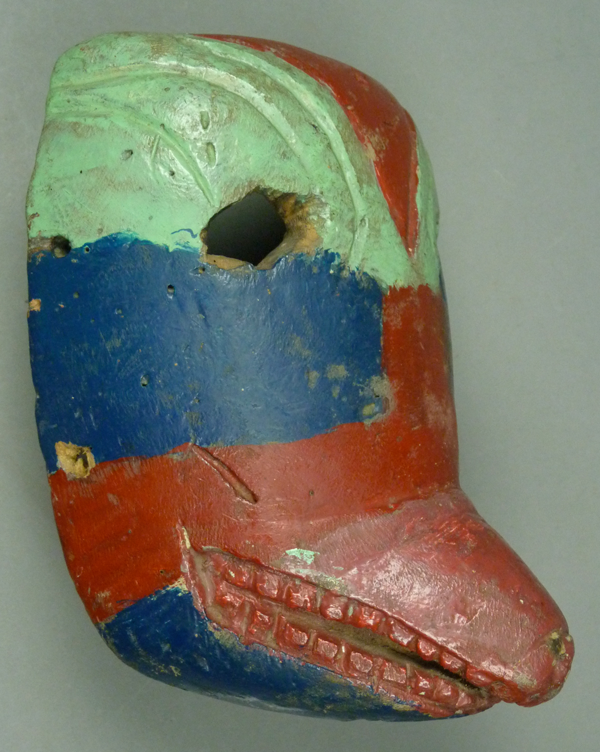 This mask is 7 inches tall, 5¼ inches wide, and 4½ inches deep. It is worn, and there is a broken area on the right edge. 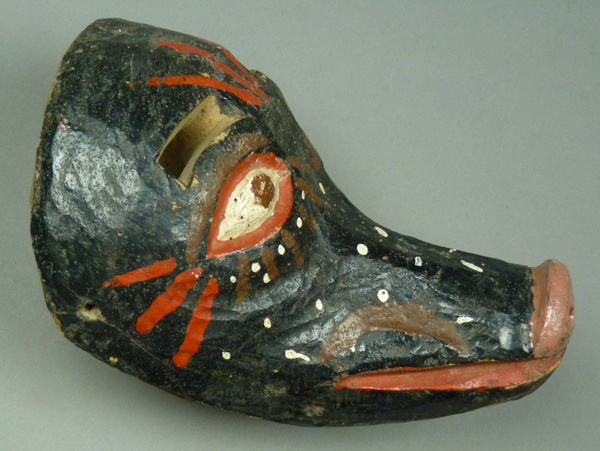 This concludes the series of posts about Xantolo masks from Hidalgo and Veracruz. 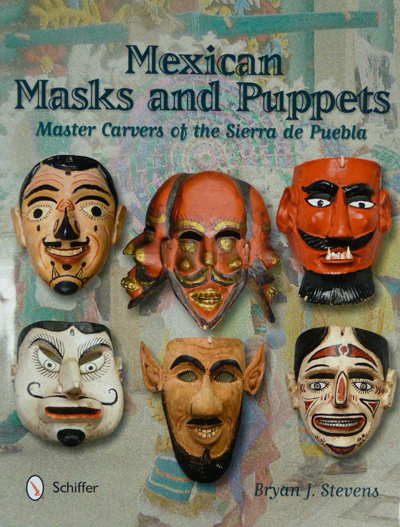 One more follows regarding human faced Xantolos from the Mexican state of San Luis Potosí.